We Are The World: Where Do You Find Encouragement and Direction? Where Do You Find Encouragement and Direction? doesn't mean they go away." I spent the night at my mother's and slept in Nana's bed which Nana no longer needs. 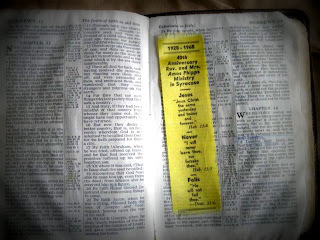 I woke up in Nana's bed next to Nana's well-worn Bible, opened it to the bookmark I made her so long ago next to the verses she vigorously underlined. And wake reminded of a grandma's love, an example I study as I am now a grandma myself. Self-indulgently, I shed a few tears and missed my Nana so much. Does she know how much? Wistfully, I posted the picture and my thoughts on Facebook, using technology to uplift, encourage, share. 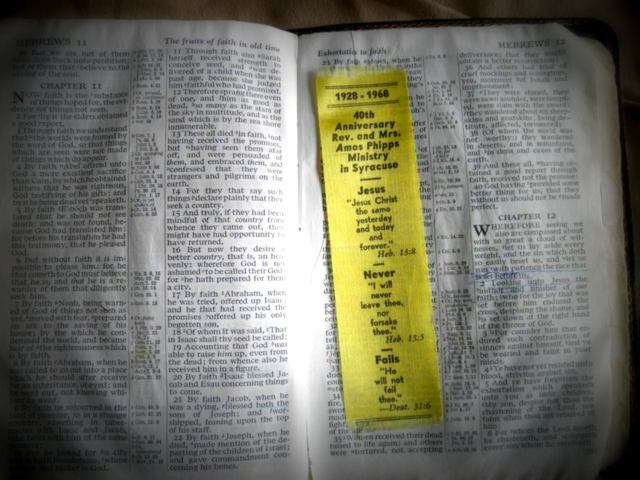 She, too, shared her Nana's Bible and said: "Here's Nana's sister's Bible with a bookmark celebrating the ministry of their Aunt Bess and Uncle Amos Phipps. 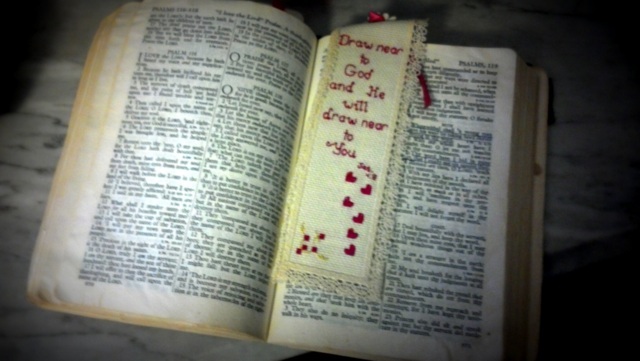 Grandma had Hebrews 12:1 & 2 underlined. You and I (and the Morse/Furman/Maslar clan) sure do have a cloud of witnesses." God took Mark Zuckerburg's Facebook and the Third Day guys' written and published song and my third cousin 800 miles away viewing my post, glancing at her own Nana's Bible and for our Nanas to be sisters who trusted God, led by the example of an Aunt and Uncle who boldly served God before them and I marvel that God Himself would bring them all together to massage my downtrodden heart and strengthen my weakened faith at precisely the right moment. and he heard me out of his holy hill." So, of course, I had to blog the whole thing. If you don't understand any of this, click here to see why. If you knew Nana or her sisters, I'd love to hear your comments. To read more about Nana, click here and follow the links. To read more about Nana's Sister, click here. Your Nana was a very sweet and compassionate woman who loved The Lord and her family! Such a great memories you have of her! Grandma Furman was such a prayer warrior! It meant so much to me to know that she was praying for me. I try to follow her example but often fall short. I miss her lots but am so thankful for my Godly heritage. I praise Him for His faithfulness even when I falter. Thanks Fern and Brenda, so glad to hear similar memories. I know how much you loved your Nana and so did she I can pomise you that. The times with you were special to her and especially in the end, she knew it was an effort for you to drive way up here so often but oh how much she loved that time together.